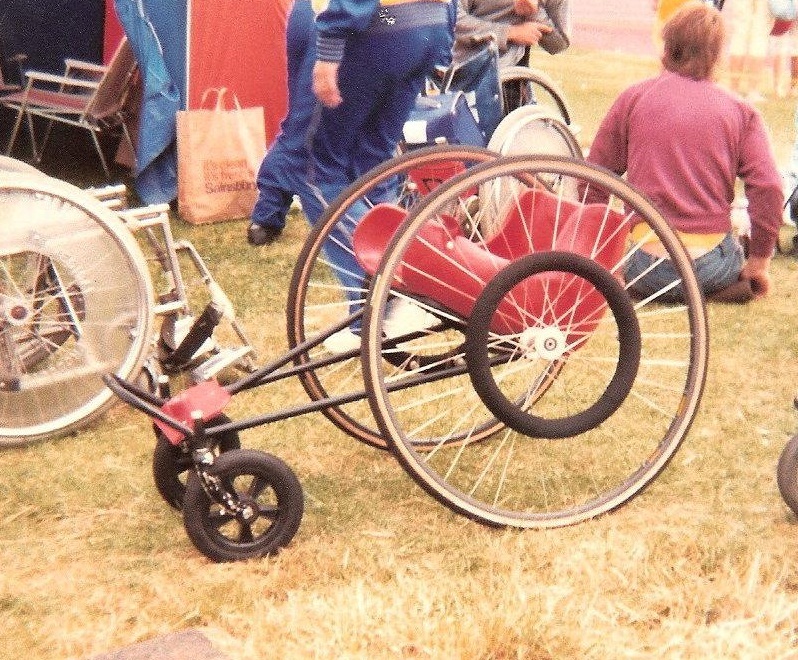 The 1984 games at Stoke Mandeville was arguably the moment when sports wheelchairs came into their own. 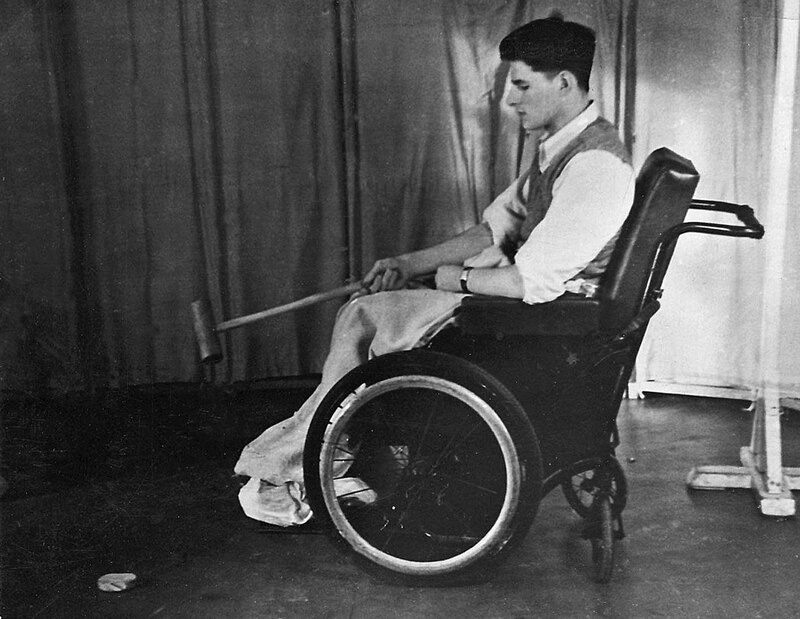 For years disabled athletes had struggled with heavy, one-size-fits-all machines for their sports. But by the beginning of the 1980s the combination of new designs, new light-weight materials and new technologies was starting to transform wheelchair sports. 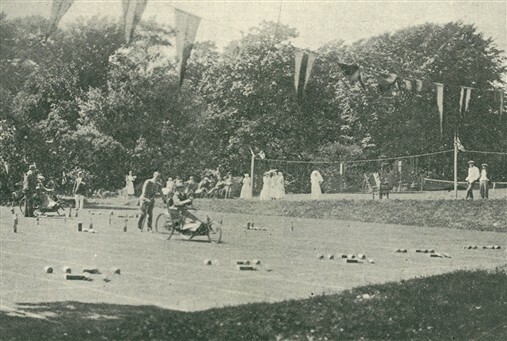 The first wheelchair sports event was probably one that took place in 1923 at the Royal Star and Garter Home in Richmond, Surrey where a group of diabled ex-servicemen competed in a 'Zig Zag obstacle race' in their rather primitive wheelchair tricycles as part of the home's annual sports day. Some of the first patients at Stoke in the late 1940s had to use rather crude self-propelled carts. "We called them ‘Push-Pulls’; they were a low four-wheeled cart that a patient could sit themselves in and they had two levers each side which they would move backwards and forwards to propel themself along.They were just going out of use when I started at Stoke in 1948." Joan, nurse. The earliest wheelchairs at Stoke were known as "travaux" chairs. "They were like brown leather armchairs on wheels and apparently very comfortable, even if not very manoueverable." All sports, even netball and basketball, were done in them. Folding chairs from America - like the Dingwall - and the Everest and Jennings chairs were first introduced in the late 1940s. Paul Cartwright testing his bespoke Bromakin chair in 1984. Its designer, Peter Caruthers, is racing behind him." 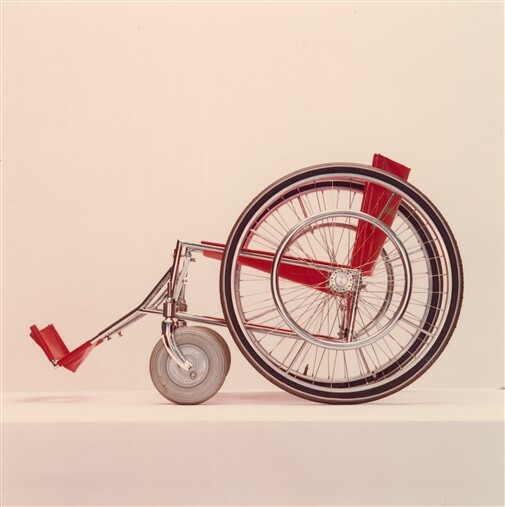 "At that time [in the late 1970s] you couldn’t adjust the setting of a wheelchair. But I developed this metal block for the rear axle, about 3” x 5”, that was drilled with 9 to 12 holes. It was welded onto the frame edge where the old axle was fixed and then re-chromed. 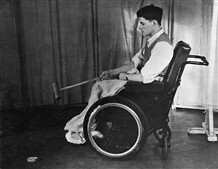 This allowed you to raise or lower the height of the chair and change the position of the back wheels, forward or back. I called it the ‘Varioblock’ and I was the first person in the world to enable these changes to the axle position." 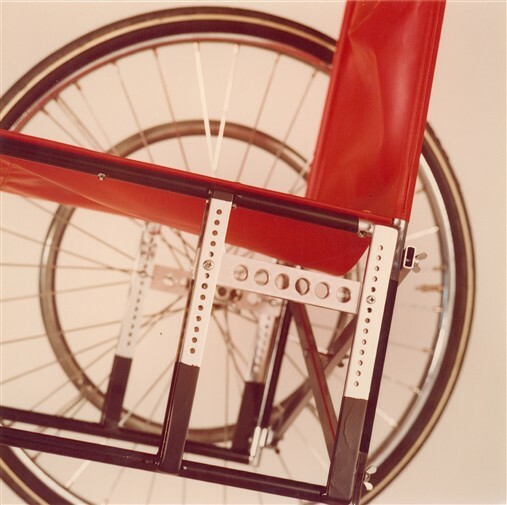 The Varioblock allowed the wheelbase and height of a chair to be adjusted; it was the end of the "one-size-fits-all" wheelchair. "I found a garage mechanic who wanted to do some extra work in the evenings and we would work like idiots all night, modifying existing wheel chairs. People were amazed and my disabled friends began asking me to customise their chairs. I started off doing things like cutting down the cross members and adjusting the chair, chopping bits out from the top crossbars which then shortened the top cross and produced a negative wheel camber." 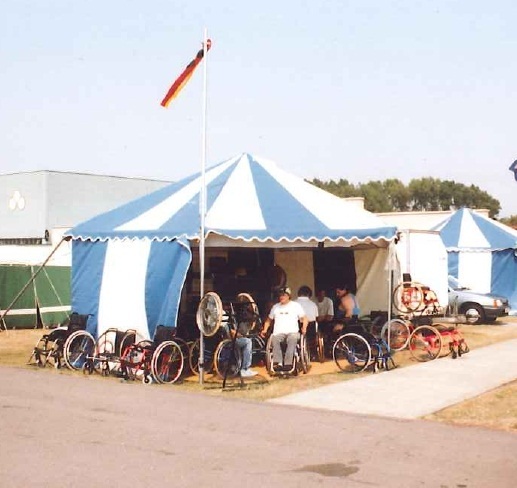 At the 1984 Stoke Mandeville Games the organisers had to come to terms with this sea-change in the use of sports wheelchairs. Not only were the various national teams coming with much larger numbers of chairs, there were also expectations about being able to get them repaired and serviced. Wheelchair repairs - which had previously been a bit of a local cottage industry - quickly developed into something a lot bigger and more professsional. 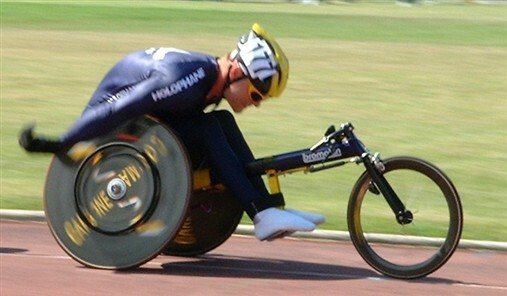 The biggest change in sports racing wheelchair design came after the Seoul Paralympics. Prior to 1988 the rules around wheel chair racing were quite restrictive in terms of what sort of machine you could use. Today those chairs with no steering, four wheels and use of castors seem very unsophisticated, . 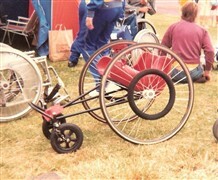 It was Bob Hall, US marathon racer, who designed the first effective and stable three wheeled chair; his design was quickly copied by other athletes. A Bromakin chair in 1990. After the 1988 Seoul games the changes to the rules transformed sports chair design. Rainer Küschall came to Stoke Mandeville from Switzerland for treatment in 1964. 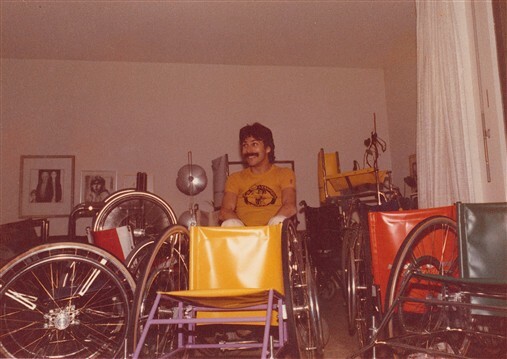 He went on to found his own company designing and manufacturing wheel chairs. He competed in Olympic games between 1968 and 1992 in table tennis and then racing at all distances up to marathon. 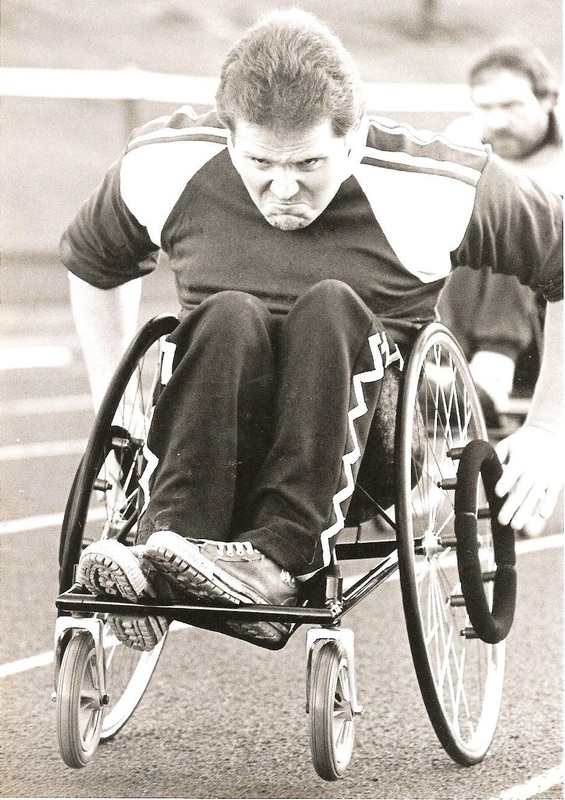 Peter Caruthers was a wheelchair racer who went on to set up Bromakin, a UK company designing and manufacturing sports wheelchairs. Read the full interviews with Rainer and Peter below. These documents open in a separate window.